Parking Madness 2015: Can Your Parking Crater Compete? The image that won Rochester the Golden Crater in 2014. March is a special month on Streetsblog. It’s the time when the nation’s worst downtown parking scars face off head-to-head for the shame of winning the “golden crater” — and the local publicity bonanza that comes with it. For the third year running, we’re asking you to help seed the bracket in our Parking Madness tournament by sending in photos of the sorriest wastes of urban space you can find. What makes for a good entry? We’re looking for downtown parking craters — expanses of urban land where there’s no longer space for people, just a sea of car storage — in North American cities. Craters that have already competed in Parking Madness tournaments are ineligible — please check the brackets from 2013 and 2014 before submitting. To enter, send us a photo of the crater and a link to an aerial map (not just the link, please), as well as a description of why your crater deserves to win. You can submit your entry in the comments or email angie [at] streetsblog [dot] org. Thanks for participating — looking forward to a new round of spectacular eyesores! Downtown Tulsa dominated the competition in 2013. So a runner-up can never become a winner, no matter how hard it works? Maybe in a few years we’ll do a tournament of champions with some of the top contenders from past brackets, but for now we’re looking to give a fresh pool of contestants a chance to win. Tampa, FL. This area is adjacent to both the Tampa Bay Times Forum (where the Lightning play) and the middle of downtown. Aside from the sea of designated parking lots, the empty lots in the bottom left of the picture are used at overflow parking during games. There is almost NO lighting and sidewalks. Outside the picture to the left is Harbour Island, an island with million dollar condos and a beautiful riverwalk. Outside the picture at the bottom is the Channelside district, a new district of mixed use condos and retail, very walkable. And to the top and right is the central business district. This crater separates the three areas and is a pedestrian wasteland. This one. It isfeet from the channels and river that surround downtown. While the hockey team owner says he plans on developing it — so far no ground has been broken. I’m concerned that if there is ever development in that area, like the hockey team owner has mentioned, the expressway will prevent it from spreading to the whole crater, it’ll just stay to one side. Freeways have a tendency to do that. SW corner of Dallas. The big brown patch was turned into a grassy field for some Final Four events last year, but otherwise the only time this part of downtown is active is when floats line up in the parking lots for a downtown parade. My entry: the neighborhood-killing parking lots on the waterfront in Camden, New Jersey. Years ago, this area housed factories for companies like RCA. Ever since, they’ve been used as parking lots for the equally neighborhood-deadening L3 Building, which is essentially a fortress separating employees from the rest of the city. Residents of the Cooper-Grant neighborhood are trying to rebuild a viable neighborhood here, and the negative effects of these huge parking lots stand directly in the way of that goal. The area is centered on E 2nd St & Grove St, Fort Worth, TX. Montreal, around the central station. This is beautiful downtown Newport News, Virginia. The sea of surface parking belongs to the shipyard and creates a dead zone of about 20 city blocks separating the rest of downtown from a residential area to the North (and the CSX tracks cut the area off from the neighborhood to the east). I weep for any pedestrian that has to hoof it through this asphalt wasteland. I worked one summer down there and even twenty-five years earlier it was just this bad. Downtown Boise and the fabulous dirt lot between the Front/Myrtle couplet. Asheville’s downtown area known as the “South Slope.” That’s the transit center in the middle (blue linear feature running left to right). 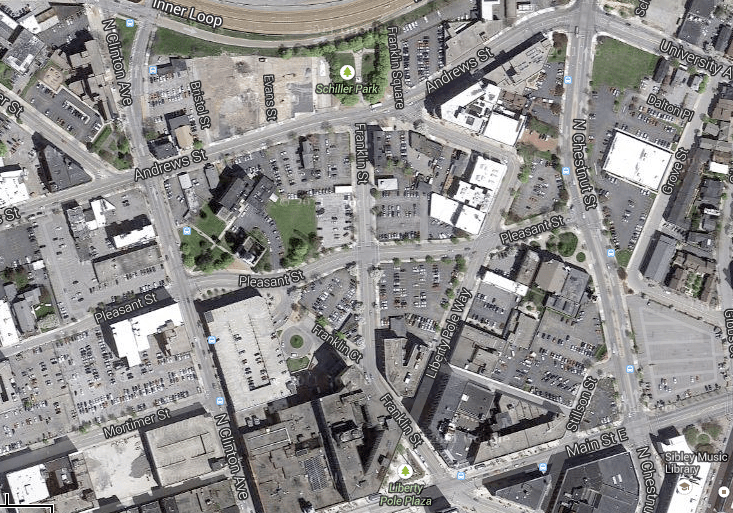 Luckily, the city is looking at wholesale redevelopment and reconfiguration of the street. The County just proposed a new parking garage to replace the surface lot to the east of the transit center. The southern bit of Downtown Riverside, south of the courthouses– in the 15 square blocks bounded by 11th, Market, 14th, and the 91 freeway has 4 parking garages that are at least half the area of the block– including two that are basically the entire block– massive surface lots in front of the Family Court (Market/11th) and the County Building (Lemon/12th), and most of the buildings with their own tiny moats. Oh, and let’s toss in a drive-thru right on the main downtown thoroughfare while we’re at it. Atlantic City, NJ: This fast-fading shore resort’s “city fathers” have run a multi-million-dollar ad campaign to try to get people to “do” it and are scratching their heads wondering why it’s not happening. A place of Jane Jacobs-ian “gray areas” and “no man’s lands”. The grassy area on the lower right is an historic fort, completely encircled by an off-ramp from I-10 onto “Water Street,” which ironically cuts off the whole downtown area from said water (the Mobile River). Please note: extra parking provided inside of off-ramp, and between Water Street and cruise ship. Then, just to the north: Downtown Mobile. It’s hard to choose my favorite parking lot, but if forced I’d say it’s the one abutting Bienville Square’s (the green block) western edge. Great use of a city square! Downtown Topeka, KS looks pretty bad after a little searching through cities..
Walnut Creek, California, is located only 35 minutes from downtown San Francisco by BART (metro). I live in Walnut Creek because my home is 1.5 miles from the BART station but also 0.3 miles from a trailhead accessing 500 miles of dirt trails around Mt. Diablo. Off the photo to the right is the Iron Horse Trail, a 35 mile-long paved separated class I bike/ped facility running north/south. As you can see from the photo, to access the BART station (bottom/left quartile of photo) from the trail (0.7 miles away) one has to pass by or through parking lot after parking lot on a busy road or sidewalk. The city of Walnut Creek could have a bustling people-filled downtown but instead allocates much space to car storage. Here is my nomination for your new parking crater contest. This parking crater is in the heart of Waterville, Maine, and it is called “The Concourse”, apparently in an attempt to gloss over the damage to the city. Waterville is a small city with a population of only 15,800 for the city itself, and perhaps 40,000 for the greater Waterville area. 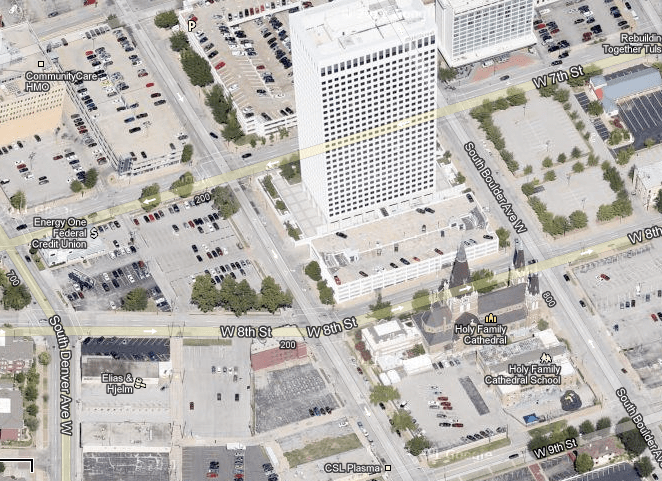 The bird’s eye view is from Bing maps. The coordinates are roughly 44.55 N and 69.63 W. This crater has over 600 parking spaces, not counting those along adjacent streets, on roughly 6 acres of land, including the access roads. This crater dates from about 1970, when Urban Removal came to Waterville, which means the economic damage from this crater has continued for about 45 years. What makes this parking crater so special? I see at least five problems with this parking crater. First, not only is this crater unusually large for a small city, it is located in the heart of the city, on what should be the most valuable land in the whole Waterville area. Second, this crater is entirely city owned, which means the city receives no tax revenue from this valuable land, and other taxpayers have to make up the difference. Third, because it is all free parking, including the area designated for all day parking, the city collects no parking revenue from this crater. Fourth, because it is city owned, and in Maine, where we have long, cold, snowy winters, the city pays the entire cost of snow removal each winter . And fifth, here in Maine, where most of a city’s revenue comes from property taxes, much of the cost for snow removal and other expenses, including lighting, falls on homeowners, including those who own cars but rarely use this parking crater, and a significant number of low income people who don’t even own cars. For a quick recap, this parking crater is unusually large for the size of the city, it is on the most valuable land in the city, it produces no property tax or parking revenue for the city, and the city is stuck with all snow removal and lighting expenses, which are paid mostly out of property tax revenue from homeowners, rather than some form of automobile user fees. I give you the Franchise Tax Board headquarters office for the state of California. The state government here is continually pushing carbon-neutral sustainable development, but one of its largest agencies chooses to locate here? It may be adjacent to light rail, but it’s surrounded by acres and acres or parking and located miles from any downtown. I tried to nominate the South Boston Waterfront (AKA Seaport District) last round, but I missed the deadline. If this one doesn’t not make it to the finals, your northeastern bias will be cemented once and for all. It’s one gigantic parking lot, almost the size of all of downtown Boston. Midtown Nashville, a sea of parking around a hospital cluster. Some of these rooftops are multi-story parking garages. Downtown Denver, where most office buildings have parking garages underneath them, which saves space for more office buildings, more downtown restaurants, microbreweries, and bars, and many more $1 million loft condos with parking garages underneath them too! I simply cannot BELIEVE you nominated Waterville! I was going to, but I thought the idea of nominating a small city with a (perceived-to-be) insignificant parking crater would go over like a lead balloon. As a guy who grew up across the river, I can attest to the fact that the Concourse is a horrible parking crater. Agree with your ENTIRE post. And nice to see you on Strong Towns, too. Way to go, Bicycle Boy! Except now there are buildings in a lot of those parking lots and many more coming in the next few years! Not quite, Charlie. I was just there two weeks ago. There is still plenty of surface parking surrounding the new buildings. I don’t believe the South Boston waterfront deserves to be in the tournament. Historically, this area never was part of downtown, but evolved into an huge parking lot adjacent to it. But now a very healthy downtown Boston is expanding into this area, and most of these lots will built on in the near future. This is a very different situation from cities that demolish a large number of its downtown buildings that get turned into parking lots. It’s a parking crater smack dab in the middle of the city core. How it got there is really not relevant. It sat undeveloped for decades and is just now starting to redevelop (unfortunately under an automobile-oriented pseudo-suburban office park model). I guess something is better than nothing, though. South Boston waterfront “smack dab in the middle of the city’s core”? Are you serious? You can argue about where exactly the city’s core is, (Downtown Crossing, Old State House, Government Center? ), but all the them are just shy of a mile from the new Moakley Courthouse, the closest point to downtown in the new Seaport District. I see this didn’t make it into the brackets this year. Please resubmit it next year. It’s one of the more spectacular ones I’ve seen. Jeeezus. Again, sorry this didn’t make it into the contest this year — it really deserves it. OK, thanks, I work hard to change the parking rules and planning in Quebec. We’re Looking for the Most Improved Parking Crater! This year's tournament will match up reformed parking craters: Former surface lots that are now filled with city. Send us entries! Your 2016 Parking Madness Champion Is… Louisville!